EX-SUNDERLAND loanee Stewart Downing denied the Black Cats a pre-derby victory, as Gus Poyet’s side reached double figures in their tally of Premier League draws. 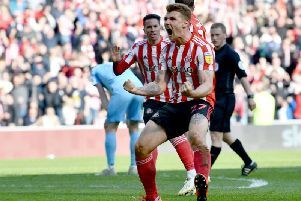 Downing’s equaliser ensured Sunderland finished all-square for the 10th time this season, as the hosts were left frustrated at the Stadium of Light prior to next weekend’s Tyne-Wear derby. Jordi Gomez had converted Sunderland’s first penalty of the season to break the deadlock, but just seven minutes later, the Spaniard inadvertantly contributed to the leveller as Downing’s shot deflected off his heels and into the far corner. Sunderland had several near-misses in the search for a winner, with Jozy Altidore spurning a sitter on the stroke of half-time. The Black Cats should have been awarded a second penalty when referee Phil Dowd missed a blatant handball, before Connor Wickham was denied late-on by a wonderful finger-tip save from Hammers stopper Adrian. Jozy Altidore kept his place in the starting XI, with Gus Poyet making just one change to his side, as Lee Cattermole came back in for Liam Bridcutt. West Ham also made one change, with Diafra Sakho preferred to Enner Valencia up front. Ex-Newcastle pair Andy Carroll and Kevin Nolan both started. Sunderland had a let-off in the sixth minute when Anthony Reveillere made an awful headed clearance to Alex Song’s angled ball over the top. Reveillere’s header went straight to Carl Jenkinson, but his volley from six yards out was saved excellently low to his right by Costel Pantilimon. Three minutes later, Stewart Downing whipped in a pacy left-wing cross, but there was too much on it for Carroll, who sent his header well over the top. Jenkinson had another effort in the 15th minute when he was picked out by Song’s crossfield pass, went past Adam Johnson with his first touch, but then fired an angled drive straight at Pantilimon. But six minutes later Sunderland were handed a spot-kick after Johnson went to ground under a slight push from James Tomkins as he burst down the right-hand side of the area. Gomez stepped up and sent Adrian the wrong way; planting the spot-kick into the bottom right-hand corner. It took West Ham until the 29th minute to level as Downing cut inside off the right and struck a low left-footed shot from the edge of the box which deflected off Gomez and into the far bottom corner. Buoyed by that equaliser, the Hammers continued to look the more dangerous of the two sides and went close seven minutes before half-time. Cheikhou Kouyate produced a brilliant long ball on the turn in behind the Sunderland defence, which set Sakho free down the right-hand side of the area. But Sakho’s shot across goal flew a couple of yards wide of the far post. On the stroke of half-time, Sunderland should have regained the advantage when Santiago Vergini picked out Seb Larsson who had burst down the right-hand side of the area. Larsson’s cross was on a plate for Altidore four yards out, but he somehow fluffed his lines as the ball got stuck under his foot without even getting a shot away. Johnson tested Adrian’s reflexes in the 56th minute with an angled free-kick from the right-hand side of the area which was punched away by the Hammers keeper. Pantilimon came to the rescue again on the hour mark when Downing picked out the overlapping Aaron Cresswell, which sent the left-back in behind the Sunderland defence. Cresswell tried to squeeze the ball under Pantilimon, but the Sunderland keeper made a superb block. The Hammers had an even better opportunity moments later when the ball broke to Carroll, 12 yards out, who tried to lift it over the advancing Pantilimon, but his attempted shot landed on the roof of the net. Sunderland should have had a second penalty in the 72nd minute when Vergini’s cross from the right was almost caught by Winston Reid, but referee Phil Dowd missed it. Wickham was a whisker away from regaining the advantage with five minutes to go after Fletcher knocked the ball into his path from substitute Ricky Alvarez’s ball over the top. Wickham opened up his body with his first touch and then unleashed a thunderbolt right-footed shot which was brilliantly tipped over the bar by Adrian. From Larsson’s resulting corner, the ball bounced off Carroll’s back and just over the top. In the last minute, Carroll went desperately close at the other end when Wickham’s clearance fell to him on the edge of the area and he curled a low shot just wide.